Get off the beaten path and immerse yourself in Tanzania’s stunning landscapes and wildlife in Ruaha and Selous. As throngs of other tourists to explore the more famous game parks up north, experience true Africa. Search for giraffe, elephants, lions, wild dogs and more in isolated and untrammeled parks, and see what Africa might have been like 100 years ago. Here it feels as though you have Africa all to yourself. You are met at the airport on arrival and transferred to your hotel. The next morning fly off into Ruaha, a hidden gem, home to some of the most diverse game viewing in all of Tanzania. Spot giraffe, zebra, impala, huge numbers of elephant and unique game like greater and lesser kudu, eland, sable and roan antelope. A cruise along the Ruaha River and spot huge Nile crocodiles, pods of hippo and more. Ruaha has an abundance of predators, from leopard to roaming cheetah, hyena and jackals, not to mention huge lion prides. 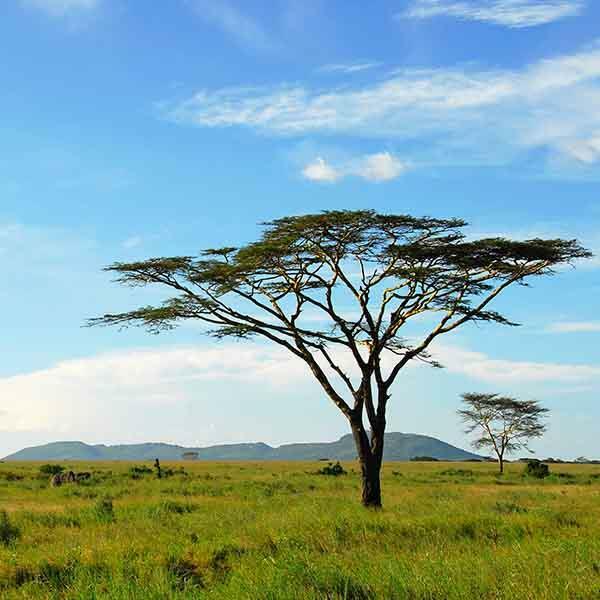 Explore hills, rivers and the escarpment that is actually part of the Great Rift Valley. Look up to spot leopard in the rare baobab forests, sausage, acacia and ebony trees. This terrain makes for fascinating walking and driving country, with few others around. Fly on to finish in Selous and the endless horizons of the African wilderness. Explore a unique array of environmental biodiversity, from the riverine forests, miombo woodlands and plains to the fascinating lake regions of Tagalala and Mwanze. Embark on captivating game drives, walking safaris and boat safaris as you track elephant, buffalo, waterbuck, impala, giraffe, wild dog, wart hog, hippo, baboon or hyena to name just a few. Then enjoy a unique chance to sleep out under the stars in a private treehouse as the wild night songs begin their melodies around you. This is untouched Africa. With your expert guide, head out on daily games drives, walks and boating safaris as you discover the wild heart of Africa. Enjoy incredible access to game and in between activities, enjoy sumptuous meals and attentive service. In the evenings, relax in a mix of luxury hotels, charming tented camps and hand-picked lodges that offer elegant surroundings in wild, complete with picture perfect views.